Controlling humidity in buildings is critical to occupant comfort. It is also important to protecting building infrastructure, production processes, stored goods and museum artwork. 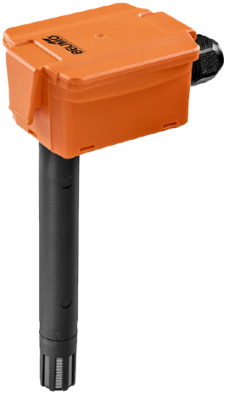 The range of durable duct, outdoor air and condensation sensors is designed to provide energy-efficient monitoring and is compatible with all major BACS. High-quality sensors that perform reliably provide high accuracy and repeatability. Combined temperature and humidity sensors provide a flexible and cost-effective solution. Complementary Metal Oxide Semiconductor (CMOS) based polymer-capacitance sensor with an accuracy of ±2% relative humidity as standard and long-term drift <±0.25% not affected by high humidity and contaminants. Multisensor with selectable output-measurement values: relative humidity, absolute humidity, enthalpy and dew point. Up to 4 field-selectable temperature measurement ranges provide flexibility during commissioning, simplify logistics and reduce stock storage. Outdoor Air, Duct and Condensation.